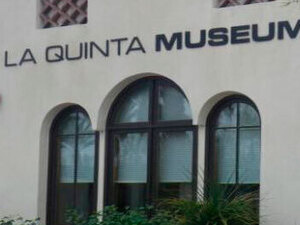 The La Quinta Museum showcases La Quinta's history and cultural arts through displays on two floors. There is a diorama of a Cahuilla Indian village and another depicting native animals. Photos of the early resorts remind us of the attraction of the desert early on. The community room exhibits a 32 foot long mural of La Quinta highlights painted by Andre Blanche. While you're there stop in the Museum Store, the place to shop for books about the area and many unique items, some created by local artists.